Taylor Sheridan is a writer whose fascination with the western ethos has prompted him to write screenplays highlighting the cultural (and cross-cultural) tugs and binds for people living in the spirit of the American West (Sicario, Hell or High Water, Wind River). 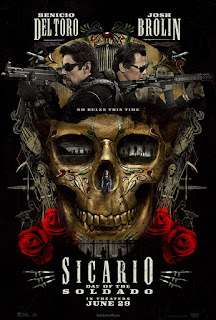 And now comes Sicario: Day of the Soldado, where he picks up on the Mexican-American border and cartel issues seen in the first Sicario. 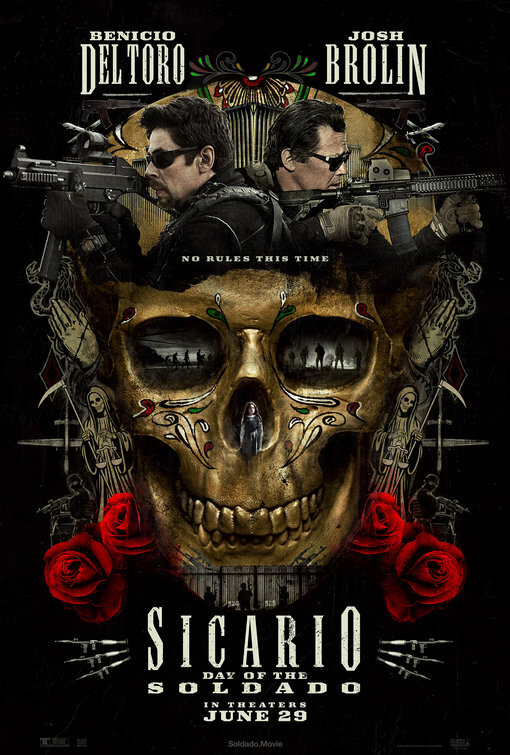 Our familiar protagonists, Alejandro (Del Toro) and Matt Graver (Brolin) are charged with pitting two Mexican cartels against each other to stem the tide of human trafficking to the U.S., which has now become the most valuable commodity for them. The immediate plan is to kidnap the daughter of the Reyes cartel “king”, Isabel (Moner), and use her as leverage with the Matamoros cartel. Things don’t go as planned, of course, and when Isabel escapes amidst gunfire and strikes out on her own, Alejandro goes after her, telling Matt to meet him at the border. It will not be an easy task. In the interim will be an encounter with a deaf-mute (fortunately, Alejandro knows sign language), identification of Alejandro and his charge by a sharp young trafficker at the border (Rodriguez), and no communication with the American agents. The film purposefully leaves us hanging in its last scenes, and sets us up for the inevitable sequel, which we all get tired of, but which will nevertheless be foisted upon us anyway. Word on the street is that Emily Blunt will be featured in the third edition, but I hope that Sheridan will figure out how to write a role for her that will show strength and resourcefulness without the stereotypical “female” characteristics, which he seems to be stuck on. One of the things that bothered me most in this film was to see Isabel portrayed in the beginning as a bully-female, beating up a fellow student and showing a narcissistic kind of entitlement when confronted by her school principal. This scene kept me from sympathizing with her when she got kidnapped. Yes, a privileged child might behave that way, but how much more inspiring and creative it would be to show her evolving as experience and time transpire. The film shows a bit of this when she takes up for her captor at one point, but in this case, like with many of Sheridan’s female characters, it’s not a full-blown effect. It would have been better to give her more charisma and feistiness, making her someone the audience could delight in. Another underwritten character is Cynthia Foards (Keener), the supervisor of Graver. She seems to follow her upper-level consultants mindlessly, without any creativity or assertiveness. Del Toro and Brolin play their roles as written with expert finesse, being the talented actors they are, but Del Toro can show much more frightening intimidation in his character and Brolin much more calculating bravado than they are given a chance to show here. This is a good film, but seems to be another one in which the filmmakers are so focused on sequels they slight the film they are making. Border patrol intrigue with twists. 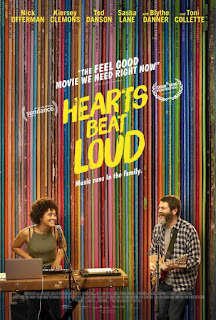 Hearts do beat loud in this Indie gem about a different kind of father-daughter relationship from what we’re used to. After her mother is killed in a bicycle accident, Frank (Offerman) provides a home for their daughter Sam (Clemons). They are close, but their most satisfying bond is playing music together. He has a struggling record store (yes—vinyl LPs), and she is a senior in high school taking pre-med courses. He is laid back; she is serious. Frank has to wheedle his daughter away from her studies to jam with him, and she indulges him on occasion. Once, she plays a riff on a song she has composed, and they make something of it. Unbeknownst to her, he puts it on Spotify, and lo and behold he hears it on a mixed tape at the coffee store. This is all he needs to spur him on and plead with his daughter to pursue a career in music. What plays out is unique in the world of cinema; it’s a true-to-life drama that is realistic and plausible. I congratulate the director and co-writer Mark Basch on their accomplishment in creating a fiction that is gripping AND could very well be true. It could have been dramatized so differently in terms of Frank losing his business, his relationship with his landlady (Collette), his daughter getting involved in a relationship with Rose (Lane), etc. But the filmmakers kept their feet on the ground and gave us a delightful story about one father and daughter. 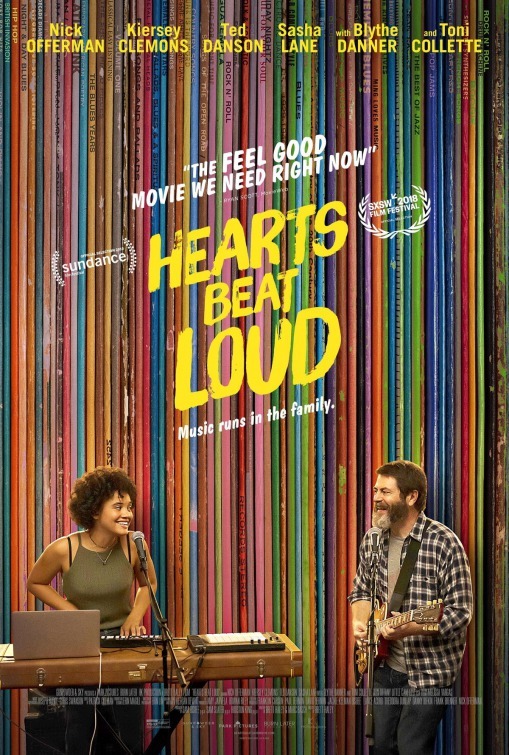 In addition to the script, the actors are superb—one of the best performances by Nick Offerman I’ve seen—complemented by Kiercey Clemons, a talent we will be sure to see more of. Collette, Danson, and Danner have cameo roles that sync with their reputations, and Sasha Lane is a rising star with talent and charisma. But fundamentally—and in all the important considerations—this is a good, soulful movie that empty nesters and well as others will enjoy. An inspiration for father-daughter relationships. Eating Animals also does a fine job in highlighting the personal stories of farmers, ordinary citizen observers, and a former U.S. government-employed veterinarian about their lives and the costs to them and their families for speaking out. These accounts lend considerable weight to the thrust of the documentary. Apparently, industrial farming began to dominate food production in the 1970’s when corporations became a powerful force in food production. By that time, they had captured 99% of the market, after edging out independent farmers. How did they do it? 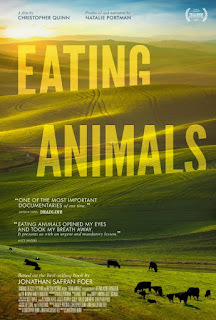 Eating Animals is a commentary about another instance in which big corporations have bought off our Congressional representatives and regulatory agencies to do their bidding. There are now “Ag-Gag” rules that prevent anyone from filming or talking about the abuses that go on in the food industry. Taking a picture on a factory farm can be a felon. This is a very even-handed account about the meat and dairy industry, being frank and illustrative without being preachy, and it shows how we all are complicit and will undoubtedly suffer the consequences further down the road. On the upside, there are U.S. companies coming up with plant-based protein, and China has announced its aims to decrease meat consumption 50% in its country by the year 2030. The unconscionable cost to animals and humans of a meat-based diet. There is a lot going on in this movie, so pay attention. 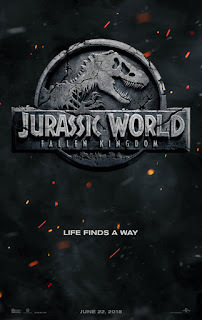 It’s a bit of a hodgepodge involving the threat of a volcano destroying the dinosaurs left on Isla Nublar (from the last Jurassic World); the reunification of Owen (Pratt) and Claire (Howard) and a bit of romantic tension; family issues among Benjamin Lockwood (Cromwell), his granddaughter Maisie (Sermon); her guardian Eli (Spall), and her nurse Iris (Chaplain); the trafficking of animals for use in genetic research and warfare; and, finally, the question of how important it is to save endangered species. Got all that? OK, then hop on board for the set-up. 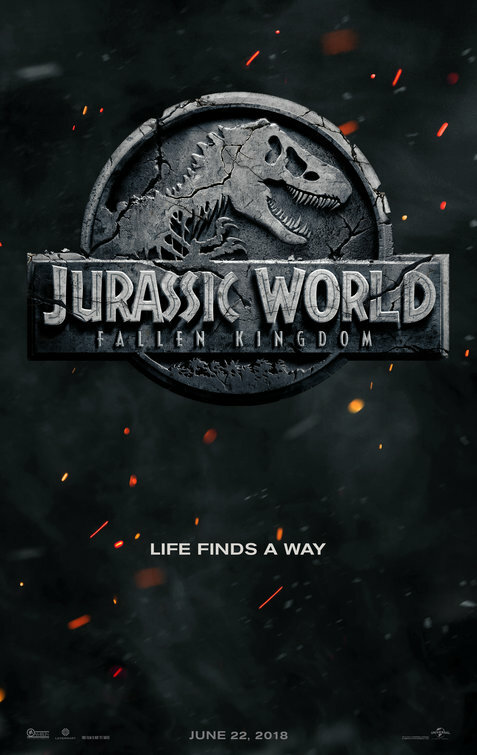 After the park closed in the last film, and the dinosaurs were left on their own, concern arises when a previously extinct volcano begins to erupt, threatening to destroy the dinosaurs’ world. Lockwood is at the end of his life and wants to do something meaningful, so he has devised a sanctuary on his estate that is big enough for the animals. He enlists the help of Claire and Owen in transporting the animals off the island to his sanctuary. There is just one problem—a big problem. His overseer Eli has let his “business opportunity” self and obsessiveness about wealth get hold of him, and has developed other plans—namely, breeding dinosaurs for specific purposes and selling them as exotic animals in the international market. All of this engages the audience emotionally (and audibly during the screening I attended), as they experience fears of animals and humans, outrage, compassion, excitement, and all the sentiments evoked in emergency situations. It’s quite a contrast between these events and the dry exhortations of the congressman Ian Malcolm (Goldblum) urging Americans to accept things as they occur without trying to intervene. J. 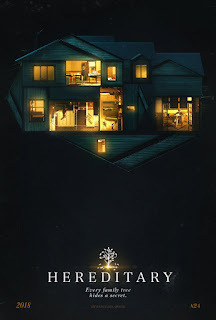 A. Bayona (The Impossible, A Monster Calls) has realized on film the Michael Crichton novel in a manner that is engaging, tense, and to some extent thought provoking. After throwing out so many pointed issues, however, the ultimate resolution is left open, from the fate of the dinosaurs, to the future of the main characters, to the fate of the world as we know it. Perhaps this is a good thing, in that it reflects succinctly our own times of upheaval. But the last 20 minutes/half hour is a little bit too much overkill (pun intended); it should have been condensed. There has probably not been a more committed public figure in defending children and voicing their needs than Fred Rogers, the man who brought the television show, “Mr. Rogers’ Neighborhood” into American homes for 30 years to talk to children about everything. He could make children feel good about who they are, and be reassured about things they might be worried about—all done in a soft, matter-of-fact way using play, song, puppets and mini-dramas. No subject was off limits, including death, illness, and national tragedy. He demonstrated that when such things are discussed in ways that children can comprehend, ask questions, and learn, they can be guided toward valuable means of coping. 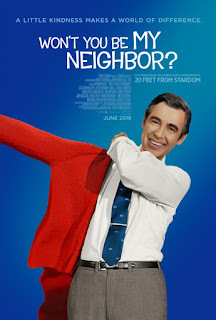 Mr. Rogers’ childhood experiences likely influenced his thoughts and ideas about children and his choices for professions as an adult, in that he was often sick (scarlet fever, for example) and had long periods of time when he used his own imagination to entertain himself; he was introspective, and thought about existential concerns; and he was bullied some at school (“Fat Freddie”). As an aside, he was very proud that he had kept his weight at 143 all his adult life—showing him that he had some control over his own life. His playfulness is shown in his relating the number 143 to an address for a puppet on his show, and one of his messages, “I love you.” (I has 1 letter, love has 4 letters, and you has 3 letters). The documentary was in the hands of Morgan Neville (writer/director of Best of Enemies: Buckley vs. Vidal, and 20 Feet from Stardom), an accomplished documentarian who captures the essence of what Fred Rogers was about in this film. It moves at a good pace, bringing in Rogers’ family, friends, and associates to give life to the man and his work. I was especially struck by Yo-Yo Ma (famed cellist) telling about his first meeting with Rogers, who immediately engaged him, got him on his show, and who later performed at his memorial service. I was also moved by Neville’s including the part where Rogers pulls in “Officer Clemmons”, a black police officer on the show but an opera singer/actor/playwright in real life, to share a wading pool with him just when the ‘70’s civil rights struggles were ongoing, a main bone of contention being “blacks’” rights to swim in “whites’” pools. Mr. Rogers talks him into cooling his weary feet, lends him a towel, and helps him dry off his feet. Fred Rogers felt strongly about television being a model and teaching tool for children, particularly in his criticism of its frenetic pace and introducing super heroes to children, which were to him, a distorted fantasy that was misguiding for children. He decried the fact that television for children was far too busy and loud, not allowing for contemplation. Rogers purposively used silence as a tool in his programs. The film has many accounts by Rogers’ family, friends, and colleagues, talking freely about the man, how they saw him, and what he taught them. It was interesting to hear about some of the fantasies about him—that he was gay, that he was a former Navy Seal, that he had tattoos—all of which seem to have been projections from people’s minds. An inspiring account of a man who dedicated his life to teaching and modeling good principles for children. Five guys are ultra serious about their game, having played it since 1983 when they were kids, convinced that it will keep them young. And they do seem like little boys playing their macho games. After they grew up, they did restrict it to the month of May, but during that month any one of them—or group of them—could appear at any time to tag someone. The one who is “it” gets to tag, and then that one becomes’ “it”, just like in the childhood game. This particular May is special (and the reason why changes across time), but Hoagie (Helms) rounds up three of them (having no compunction about interrupting a Wall Street Journal interview or even a therapy session), saying that Jerry (Renner) is getting married and dropping out after this year. Callahan (Hamm), Randy (Johnson), and Sable need little convincing to hop in the car and head to Jerry’s hometown. The stakes are soooo high because Jerry is the champion who has never been tagged. Jerry is the best part of the story, in that he is ingenious in anticipating every move of the conspirators, preparing for them in comedic ways, and—by the way—being a master in what looks like martial arts; he can foil every attack and then escape without being detected. Renner actually broke a couple of bones in doing his stunts. He is impressive to watch, and although this is not nearly the caliber of Hurt Locker—for which he is perhaps best known—the role is similar in the character’s canniness and attraction to risk. It’s certainly different in the mischievous eye of Jerry. Other main characters are in roles familiar to us. Ed Helms is the ambitious achiever who often misses the mark by just a little bit. Jon Hamm is the suave CEO of a large, successful company. Jake Johnson is the slightly manic talker with a talent for saying the wrong things. Unlike these, Hannibal Buress’ character isn’t like his previous roles; here, he is thoughtful, speaks in convoluted sentences, and is more than a little paranoid—a clever addition to the cast of characters. Females seemed to have been “tacked on” in stereotypical roles: the aggressive Anna (Fisher) dying to be a part of the guys’ game and being a female version of a guy. Susan (Bibb) being the beautiful ultra feminine bride wielding her power behind the scenes. Rebecca (Wallis), the reporter so intrigued by her subject’s life, she abandons her intended story to follow him on a tangent. The most realistic character is Cheryl (Jones), who expertly fields two suitors from high school, maintaining her equilibrium and sense of self throughout. 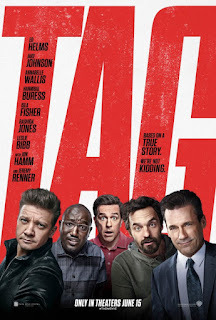 Tag reflects the backgrounds of the director (Jeff Tomsic) and writers (Rob McKittrick and Mark Steilan) being in television, although they based the story on Russell Adams’ account of the original group of men in the Wall Street Journal. It plays like an extended sitcom with a bigger budget. The audience I was with in the screening laughed heartily in the expected places, but I doubt this film will appeal to those interested in wanting comedy to push forward in a wave of creative expression that speaks to the contemporary frame of mind. A light comedy about a group of men extending their childhood game into macho competitions in adulthood. I am always partial to Brad Bird, and think that his production of Incredibles 2i s just that—impressive enough to be regarded as incredible, and a film that is likely to appeal to all ages. One of Bird’s strengths is in mixing lavish visual and special effects with an entertaining story of substance. Beyond the entertainment, values come through with respect to “doing good”, fulfilling civic duties, living up to one’s potential, and being a good parent (at times being equated with having super-powers—which I found very amusing andrealistic). The Parr family is a trifle at sea since super-powers have been outlawed (you get a real sense of loss of purpose from them), and their reputation is on the decline after their last job not turning out very well—at least in the public eye. Helen (Hunter) is flexing and saying they need to adapt, but her husband Bob (Nelson) is protesting. Then something unexpected happens; a wealthy man, Mr. Deavor (Odenkirk) who is convinced super-powers are needed, has a plan for getting the law changed, and approaches the Parr family. Well, specifically, he is asking for Elastigirl (Hunter), observing that she does less collateral damage in her heroics than her husband. Of course, this creates a crisis in the Parr household. Bob (Mr. Incredible) has trouble getting his head around the fact that someone would be preferring his wife over him, and Helen feels torn about leaving her family, even though it’s to save them. Moreover, she and young Violet (Vowell) question the wisdom of breaking the law, even if it is to do good. But Bob (to his credit) urges his wife to take up the mantle and perform a heroic act to save people and demonstrate the usefulness of super-powers. After much soul-searching, all she needs is a fancy motorcycle delivered to her garage, and she is off. Mr. Deavor is in partnership with his sister Evelyn (Keener), who has designed new suits for the Parrs that have cameras installed, as a way to publicize their achievements. What they do can be featured on the news, thus everyone will see their value, and public opinion will be successful in effecting change. There will be any number of major challenges to the Parrs, close calls, and a significant betrayal, which make the movie entertaining and provoke thought all the way through. In the process, important contemporary issues are dealt with about men vs. women and their roles, about adherence vs. protest of laws, about trust vs. betrayal, about inventors vs. sellers of a product, and even about kids vs. parents. I liked the way kids are portrayed, both needing guidance and nurturance and being listened to for their opinions. A number of clever and humorous scenes are incorporated, revealing writer-director Bird’s ingenuity, such as inserting the role that he himself voices of Edna, the woman Bob turns to when parental duties have worn him out. 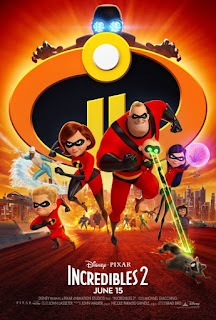 The interactions between her and the baby with emerging super powers, Jack-Jack (Fucile), are hilarious and heart-warming. The cartoon figure looks exactly like Linda Hunt (NCIS-LA), who is the wise and supportive leader of undercover operatives with a blunt-cut pageboy hairdo on CBS TV. Jack-Jack, who is gleefully playful, manages to don just such a hairdo to win her heart. An enthralling animation that will keep the whole family spellbound. Debbie has used her time in prison well, figuring out detailed plans for living up to her family name, exacting a delicious revenge, and getting a ticket to the high life for life. Debbie and Lou flesh out a strategy for a major heist of jewelry at one of THE social events of the year, the Met Gala, hosted by the iconic Vogue Magazine editor and artistic director of Conde Nast publications, Anna Wintour who appears as herself in the film. Debbie and Lou assemble a motley team of thieves, smugglers, fashion and jewelry designers, forgers, and computer geniuses to play their roles in an intricately choreographed dance designed to net them all a sizeable share. What are they after? Cartier’s 150-million-dollar diamond necklace. It will involve managing to get just the right celebrity to wear it to the ball. Some of the funniest scenes include the eccentric fashion designer Rose Weil (Carter) flattering the always-aspiring celebrity Daphne Kluger (Hathaway) to go along with the plan to wear the necklace. (Not hard at all, once she sees it.) To watch Hathaway acting out preening and self-love in brilliant red lipstick in front of the mirror as she tries on various necklaces (the real diamond one is held out as a tease) will surely make you groan and laugh at the same time. Also engaging are glimpses into the current lives of the fellow co-conspirators. Tammy (Paulson) is a contented mother who buys tens of bicycles on eBay when she has only one child. Nine Ball (or “Baller”, if you prefer) (Rihanna) is a wizard on the computer, and most of the fun here is seeing others having to catch up with her; and like any good Asian has a relative, April (Midori Francis), to come through at a crucial time. Mindy Kaling, as Amita, the jewelry designer, is trying to find a partner on an internet match site, but she will amuse and impress you with her rather naïve pronouncements coupled with design efficiency. Constance (Awkafina) always shows up just in time, and even though she is simply collecting and sorting things, you smile at her dedication. 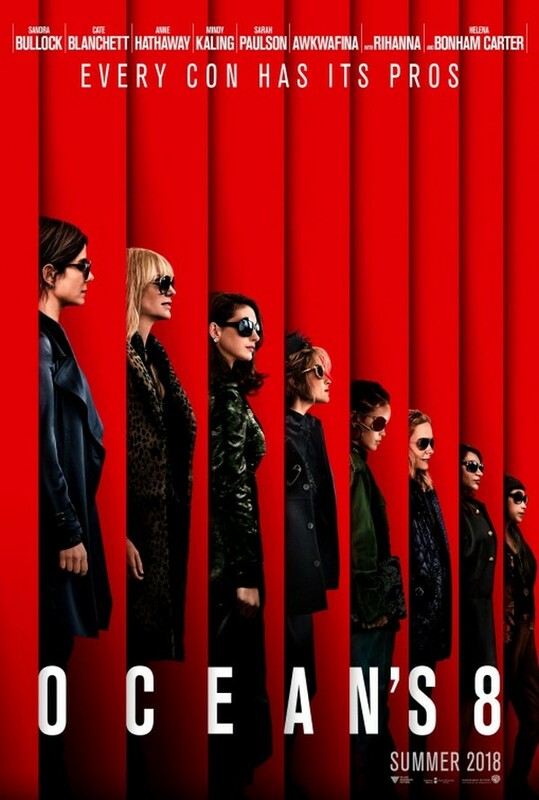 In Oceans 8, Director Gary Ross demonstrates his sensitivity toward women’s important issues, his delight in mixing up craftiness and comedy, and his flair in infusing excitement into a rather predictable plot. The journey there is the point, and it will serve as a good time to relax and simply enjoy. This Oceans’ cast impresses with its unwavering skill and art. The major protagonists and supporting actors deliver what we hope for and expect in a film of this kind. Bravo to all! This is a great movie for kicking back, relaxing, and letting the irony and truthfulness amuse you. The set-up for Hereditary is truly chilling—not too much to be unbelievable and just enough to make it plausible. The Graham family—father Steve (Byrne), mother Millie (Collette), son Peter (Wolff), and daughter Charlie (Shapiro) appear normal enough. They live in a picturesque setting in a large old house in what looks to be a small town. There are hints that strange things are going on in the scattering of dollhouses around the house (that will only become creepier later). But also noticeable is something in Charlie’s eyes and behavior. For instance, she doesn’t say much, sometimes makes a clicking noise with her tongue, is seen drawing portraits of those around her incessantly, and once, we see her do something destructive to an animal as she casually eats a candy bar. Millie’s mother has just died, and Millie wonders why she doesn’t feel like crying, but after she sneaks away to a grief-counseling group and her history tumbles out, we can see why. Sadly, she feels a bit ashamed about attending, and keeps it from her family. Millie is an artist who is trying to meet a deadline for a project that involves figures she must paint so intricately, she needs glasses like jewelers and watch repairmen wear—just another touch to add to the eeriness of the story. One evening, Peter asks to use the car to go to a party, although he presents it as a school function. His mother gives him permission, making sure there will be no alcohol, and insisting he take his younger sister Charlie along. This is one of the first set-ups typical of horror filmmakers—something that doesn’t make sense, but is needed for the plot later on. That is, why would a mother force a teenager to take a 7 year-old to a social function when neither of them wants it? At any rate, they are compliant children, and they go along. This is where the movie takes a weird turn. A tragedy occurs in which Charlie is killed, and the mother is not the same ever since. This in itself is not unusual (no one is the same after losing a child), but in a horror story like this, the occult is introduced more overtly, where there were only hints before. Millie’s chance (or not so much coincidental, as shown later) encounter with a member of the support group who hails her down at the shopping center, asks how she is doing, lets Millie know that she too has lost a son and grandchild, and gives Millie her address and phone number “if you need someone to talk to, because we all do.” Millie makes light of this, once again, significantly, not telling her husband about Joan (Dowd) or the subsequent séance that she will experience in which Joan is able to conjure up her grandchild. After this, the film goes over the top in typical horror-film paths, introducing ever more fantastic events that have the audience gasping (or laughing, depending on individual perceptions). Some of these scenes are effective (such as when Millie and Peter start to work on their issues—painful as they are. But then, the turn is to more conventional horror motifs that have little to do with reality, i.e., Paimon, a king of hell, makes his appearance. This is a more than admirable first feature by writer-director Ari Aster, and one of which he can be truly proud. His script and direction, the superb acting—particularly that of Collette—and the cinematography, music, and the rest of the crew make this a noteworthy film. The music (Colin Stetson) and camera (Pawel Pogorzelski) are visible enough to be characters in being so present in telling the story even when no actors are present. Horror films come and go, but you should take notice of this one. There is no honor among thieves—true most of the time. 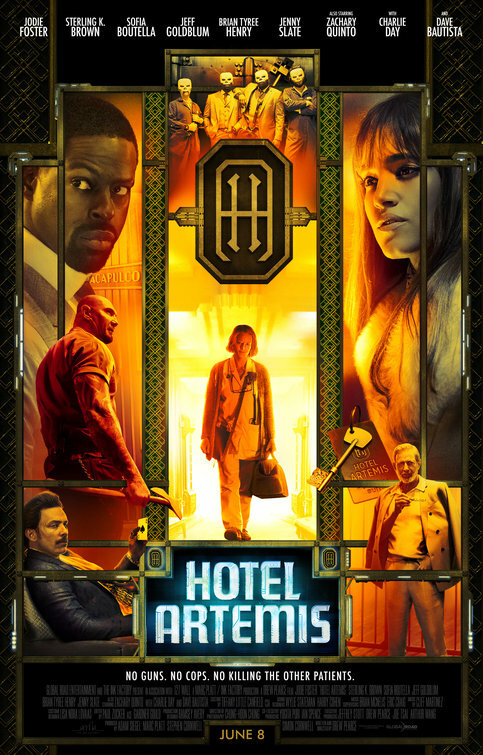 But that adage is disproven now and again in Hotel Artemis. The hotel was created as a gesture of honor years before 2028 when this story takes place, one among many interesting twists in the narrative about a kind of hospital for wounded criminals, administered by The Nurse (Foster). Riots about the shortages of water are flaming in Los Angeles, which makes the hospital very busy. But a few clear-cut rules have been designed to establish order, e.g., only paid members admitted, no cops admitted, no weapons allowed, no serial killers or pedophiles admitted, no real names used, etc. Each person is called by the name of his/her room, e.g., Waikiki, Honolulu, Acapulco, Nice. (One of the clever little features that elicits a smile from us.) Nurse runs a tight ship aided by her trusted Everest (Bautista), who towers above everyone else, is completely devoted to his job and to Nurse, and is handy in managing the electrical generators and being a bouncer when called upon. On a particular Wednesday night during the riots, only one room is vacant when Nurse is handed a dilemma that will cause her to break one of her own rules, and coincidentally, other infractions happen for various reasons, and then suddenly a call comes from the owner of the establishment needing to be admitted. This happens to be Wolf King (Goldblum), crime boss of the city. Beyond the main events, sub-plots are interwoven involving activist Waikiki (Brown) and his brother Honolulu (Henry), the assassin Nice (Boutella) and her fluctuating relationships with Waikiki and Acapulco (Day), a loud-mouth American full of bluster and entitlement, and a mysterious patient (Morgan) with a significant past connection to Nurse. This is likely to be another star in Jodie Foster’s star-studded acting crown, easily measuring up to a host of award-winning performances in Silence of the Lambs, The Accused, Taxi Driver, and Contact—just to name a few. It was personally gratifying to see her physical appearance reflecting her life of grief and servitude rather than her being “prettied up.” Gray-haired and wrinkled, and relying on inspirational tapes to manage her anxiety, asthma, and other maladies, Foster delivers on-point perfection in giving us an in-depth look at her character with a significant past. 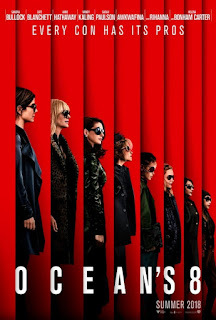 Also notable are Sofia Boutella (always mesmerizing), Sterling K. Brown as an honorable “criminal” loyal to his brother to a fault, Dave Bautista as a bouncer with a heart, Charlie Day as an American stereotype who talks too loudly and too much, and Jeff Goldblum as an astute crime boss who’s disappointed in his youngest son for being too soft. 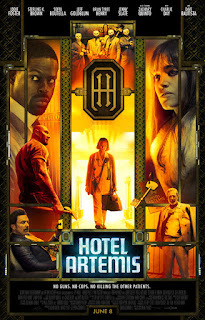 Hotel Artemis: A place like you’ve never seen before, with goings on that thrill, chill, pull the strings of your heart, and make you chuckle. This is one of those independent films that you hope will be coming up regularly forever. It takes an issue and argues it with eloquence and passion, showing both sides. That is, the audience is expected to take some responsibility for thinking about something important and reasoning through it to conclusion. Pastor Toller (Hawke) has a known past of having a son he talked into going into the military (generations of his family had attended VMI)—against his wife’s objections—and, unfortunately, Joseph was killed in Iraq. The burden of this kind of guilt is the subject of the film, and it’s put into larger contexts related to political activism, religious beliefs and meaning, and, fundamentally, hope and despair. Pastor Toller seems to be experiencing PTSD (post-traumatic stress syndrome), and trying to work through it, using scripture and group therapy, and a diary that is to be destroyed in one year. Adding to the pressure is that he is pastor of a 250 year-old church, which tries to survive by joining a much larger congregation, the Church of Abundant Life, led by Pastor Jeffers (Cedric the Entertainer). 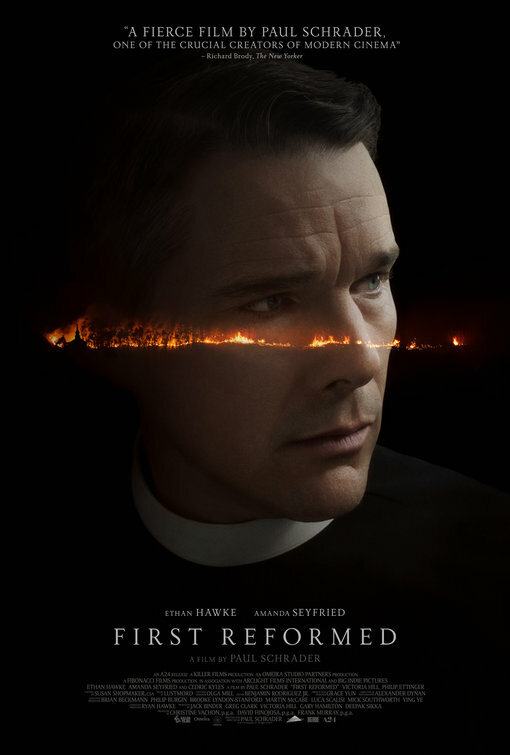 They’re all gearing up for the celebration of the re-consecration of First Reformed. Here, we see the issues of original conceptions of religion played out against the current capitalist conceptions of a religion paired with financial backing. The First Reformed Church has to collaborate with the Church of Abundant Life in planning. At first, there doesn’t seem to be much of a problem; Pastor Toller has met with Pastor Jeffers a number of times, and they seem to be on the same page. But the primary contributor to the Abundant Life Church is a businessman with a moral center that differs significantly from Pastor Toller’s. And inserted into all of this is a major complication in the form of parishioner Mary (Seyfried) asking for help from Pastor Toller for her husband, Michael (Ettinger). He is an activist for the environment, and has strong feelings about bringing a child into the world. (Mary is pregnant with their child.) He wants to abort the child, but Mary does not. Paul Schrader, the writer/director of this film, eloquently outlines the agonizing questions of our day related to climate change, personal responsibility, and political activism, and demonstrates how individuals and families can be affected. The ending of the story is drawn out, culminating in a conclusion that may be dissatisfying for many. 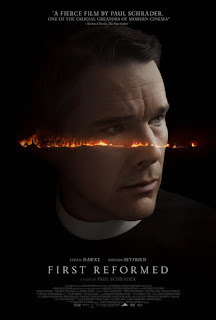 First Reformed is an outstanding production overall. Schrader is an expert in storytelling and visual effects. He and cinematographer Alexander Dynan open the film with an old white-boarded church scene suffused in a pale blue light; and these colors are seen throughout, with accents of black, bright red or other colors inserted for maximum emotional effect in certain scenes. Ethan Hawke—in his usual fine form—gives one of the best performances of his career, complemented by Amanda Seyfried as a sincere young parishioner and Cedric the Entertainer as an experienced pastor of a large, well-connected church. An impressive film in all aspects of filmmaking.